Gel polish lovers, you'll want to pay attention to this blog post! Today I'm sharing my first thoughts with some swatches and a review for the latest gel polish collection from Gelish MINI. 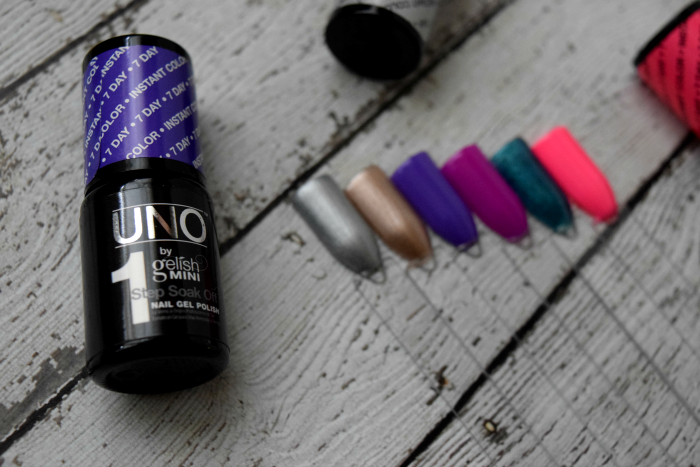 The brand new Gelish MINI UNO line is a one-step gel polish! Intrigued? Read on to learn more. A one step gel polish, you say? I've tried a few before and wasn't impressed, but I had high hopes for this one because, well, it's Gelish! My favorite brand I'm always raving about. My normal Gelish manicure is always gorgeous and lasts for around 2 weeks, sometimes more. Gelish MINI UNO is a one step gel polish that requires no base or top coat and doesn't require any cleansing after curing (no sticky residue). It cures with an LED or UV lamp and boasts 7-10 days of wear- which is not as long as a traditional gel polish, but longer than regular polish. I prepped my nails like I normally would for gels (more info on that here), and I applied Gelish cleanser and pH bond to my nails right before applying Gelish MINI UNO. The application process is virtually the same, but you just skip the base and top coat. 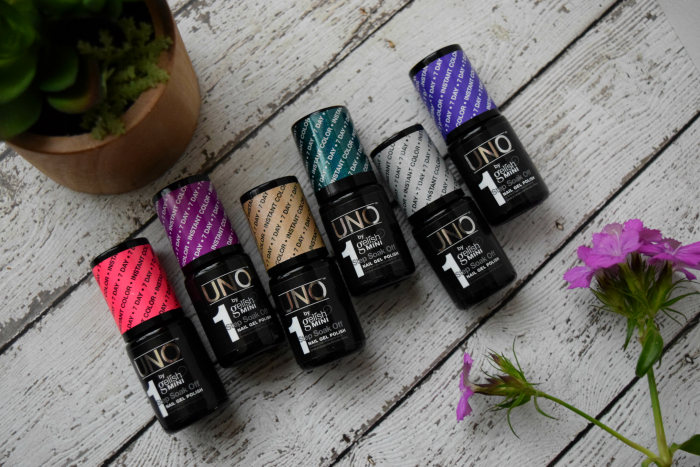 The consistency of the UNO polish was slightly thicker than their other gel polishes, but it still flowed nicely and self-leveled on the nail bed before curing. I I payed special attention to seal the free edge really well (a major key in giving your gel mani staying power). I ended up doing 4 coats of polish to get the coverage and thickness I wanted. I suggest doing an extra coat or two for added strength. Normally, I'd do a base coat and 2 top coats, so I'm losing 3 layers of thickness with the Gelish MINI UNO system and I still wanted my nails to feel protected and strong. 4 coats felt thick enough! After curing the final coat I was amazed that there was in fact no sticky residue and no need to cleanse the gel at all. They were just done with no need for a top coat! The application process for Gelish MINI UNO was easy and very similar to my usual gel polish application, except you skip the base and top coat. The consistency and coverage was good and I didn't have any problems with the gel shrinking up during curing. I did have a little bit of wrinkling, which occurs when you apply the gel too thick. I went a little too heavy-handed with the 2nd coat of polish and it wrinkled while curing, but I was able to correct it in the 3rd and 4th layer by using a smaller amount of gel and doing thin, even coats. This gel is thicker, so keep your layers thin! You can always add an extra coat, but don't glob it on. Applying Gelish MINI UNO was a little bit faster than the traditional gel polish without having to do a base and top coat (and base coat always takes me a long time because it's hard to see and I'm so meticulous about it- it was nice skipping it!) My nails felt strong and thick at the end and the polish was really shiny. I wish my review could just stop there, but unfortunatly, Gelish MINI UNO didn't last as long as I was hoping. I made it 3 days before I started getting some chips and peeling, and I ended up picking them off the 3rd night. I had really high hopes for this polish, but I really think gel polish needs a good base and top coat in order to be long lasting. The idea that you can just slap a few coats of color on and go is lovely- but let's face it, we're hard on our nails, right? If you want a gel polish with staying power...I'm talking 14+ days...stick with your traditional gel polish. Spend the extra time and do it right. If you're looking for just a few days of wear, Gelish MINI UNO might be a good, quick option for you that will look beautiful for a weekend or so. Colors shown are: Charm Bracelet, Gold Rush, Violets Are Blue, Electric Kiss, Mermaid of Honor, and Always a Bridesmaid. So while Gelish MINI UNO might not be for me, I'm still going to try it again and be a little more meticulous with my application process and see if I can get get a few more days of wear out of it. If I could stretch it out to about 5 days I would be really happy! I know everyones body chemistry is different- that's something I've learned as a professional nail technician, so every product is going to work differently on other people. I've read some great reviews for Gelish MINI UNO online, so maybe I need to tweak my application a bit and give it another try! Or, I can just use these gorgeous colors like a regular gel polish sandwiched between a base and top coat and give them some staying power. 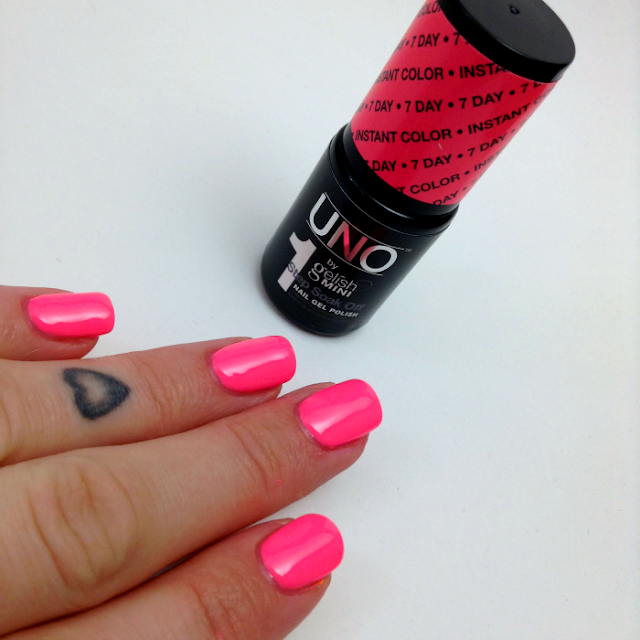 Now, for the gel polish fans, I'm giving you a chance to try out Gelish MINI UNO for yourself. One person will win 3 bottles of Gelish MINI UNO (colors will be chosen at random). Enter on the Rafflecopter widget below. Must be 18 or older to enter and open to US & Canadian residents only. I was given these products free of charge for the purpose of a review. All opinions are my own :) This post contains affiliate links.